Alex Ferguson's 70th birthday was ruined by Manchester United's stunning loss to struggling Blackburn and Chelsea slipped out of the Premier League's top four with a home defeat to Aston Villa on Saturday. Canadian international Simeon Jackson came off the bench to grab a stoppage-time equalizer as Norwich rescued a 1-1 draw against Fulham in the Premier League. 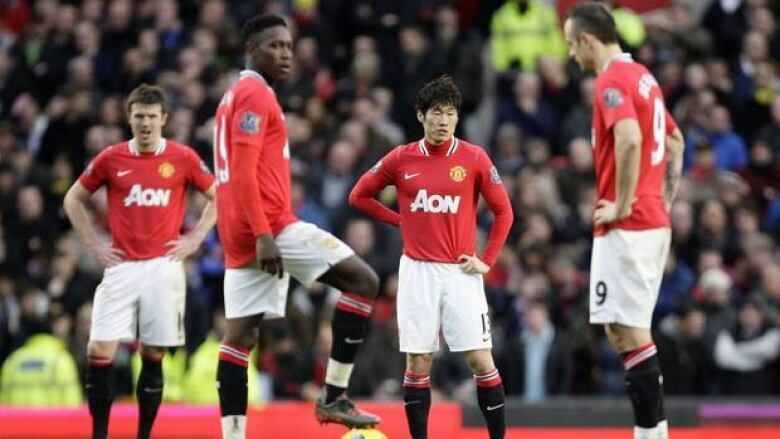 Sir Alex Ferguson's 70th birthday was ruined by Manchester United's stunning loss to struggling Blackburn and Chelsea slipped out of the Premier League's top four with a home defeat to Aston Villa. At Norwich, Portugal forward Orlando Sa had scored after just six minutes to put the visitors on course for a rare away win. But Norwich continued to press, and Jackson, who has 23 caps for Canada, nodded in Elliott Bennett's right-wing cross five minutes into added time to record his second Premier League goal, and earn Paul Lambert's side a share of the points. Fulham went ahead when Moussa Dembele was allowed to charge to the edge of the penalty area before feeding Sa, who drilled a low shot past John Ruddy into the bottom right corner. The home side was almost 2-0 down before they could mount a recovery, with fullback Kyle Naughton clearing an effort from Sa off the line. At Old Trafford, goalkeeper David de Gea's mistake allowed Grant Hanley to pounce in the 80th minute and give Blackburn a 3-2 win. "It is a disaster," Ferguson said. "I never expected it." The surprising setback for the defending champions means Manchester City can go three points clear at the top by winning at Sunderland on Sunday. "We weren't at the races. Too slow, too laboured. Not quick enough," said Phil Jones, who left Blackburn for United in the off-season. "The injuries don't help. But they are no excuse. We were nowhere near good enough ... they thoroughly deserved their win." Third-place Tottenham slipped up as well, drawing 1-1 at Swansea to sit six points behind United. The bigger winner of the day was Arsenal, which went fourth with a 1-0 victory over Queens Park Rangers after Chelsea slumped to its fifth loss of the season, with Villa winning 3-1 at Stamford Bridge. Consecutive 5-0 routs for United before facing struggling Blackburn had pointed to another easy victory on Ferguson's landmark birthday. Ayegbeni Yakubu, though, wasn't in a giving mood, scoring with a first-half penalty and a low shot past De Gea six minutes after the break. Dimitar Berbatov hit back with two quick finishes inside the area, but United couldn't stage another comeback after Hanley's winner. Blackburn manager Steve Kean hopes supporters will finally stop calling for him to be sacked by the Indian owners. "The owners are behind me and the players are behind me. Now, I'd like to think there could be a truce between me and the fans," Kean said. "It would be good if the fans who have been negative will turn, because we want Ewood Park to be a place where there is an intimidating atmosphere." United's New Year's Eve misery was shared by Chelsea. Didier Drogba gave Chelsea the lead from the penalty spot in the 23rd minute after he was fouled by Richard Dunne, but the lead lasted only five minutes. Stephen Ireland's first effort from Charles N'Zogbia's cross was blocked by John Terry but the midfielder tapped in the rebound to equalize. Stiliyan Petrov put Villa ahead in the 83rd after being set up by Ciaran Clark and three minutes later, substitute Darren Bent sealed his side's first win at Stamford Bridge since 2002. "Hopefully 2012 brings us better results," Chelsea manager Andre Villas-Boas said. "We need to improve on a couple of aspects and we know what they are. Villa punished us well in the final stages of the game." It leaves Chelsea out of the Champions League spots after Robin van Persie clinched the Arsenal win over QPR on the hour after squandering several chances in the first half. Arsenal is still three points behind north London rival Tottenham, which has a game in hand. Rafael van der Vaart had given third-place Tottenham the lead at Swansea just before half time after capitalizing on a defensive error from Joe Allen to sweep home with the help of a deflection from Ashley Williams. But Tottenham goalkeeper Brad Friedel hesitated late on when dealing with a late deflected Angel Rangel cross, allowing Scott Sinclair to nip in and equalize. The bottom three is made up of Wigan, Blackburn and Bolton. Sam Ricketts marked his return from a 10-month injury layoff by scoring for Bolton in a 1-1 draw against Wolverhampton Wanderers, which levelled through Steven Fletcher's header. Ben Watson came off the bench to salvage a 2-2 draw with a late penalty for 10-man Wigan in a dramatic finish against Stoke. Victor Moses put the struggling Latics ahead on the stroke of halftime, but Gary Caldwell was then sent off for deliberate handball in the 76th minute and Jonathan Walters converted the resulting penalty to draw eighth-placed Stoke level. Stoke thought it had secured three points when substitute Cameron Jerome scored, but Watson then converted a spot kick with his first touch, after Ryan Shotton had been penalized for a tug on Hugo Rodallega's shirt.